This topic describes the flow and tasks for initially setting up and configuring ALM Octane. Most setup and administrative tasks are done in the Settings area of ALM Octane. Some topics are relevant only for on-premises. To configure, log into the Settings area. In the top banner, click Settings . Spaces. Space and workspace settings. You can set preferences using the Settings drop-down menu. Email me when I am mentioned in a comment. Enables ALM Octane to send you a notification via email when someone tags you in a comment with the @ character. Use Sprinter to run manual tests. Enables ALM Octane to run manual tests in Sprinter rather than in the Manual Runner. For details see Run and edit manual tests in Sprinter. Data in ALM Octane is divided into separate areas within a larger environment. The separate areas are called workspaces. The environment is called the space. The spaces can be isolated or shared. Workspaces associated with shared spaces can share data. Can create multiple workspaces to represent multiple projects, programs, or products managed on the same ALM Octane site. Can also add users, and assign users different roles within workspaces. They also assign admins for each workspace. Can manage data inside their workspaces that are associated with isolated spaces. This includes releases, teams, users, the backlog, application modules, tests, defects, and so on. Can only access workspaces that they are assigned to. All users are automatically assigned basic access privileges within the default workspace. To learn more about users and their roles, see Assign roles and permissions. The flow for configuration is provided here. Set up spaces and workspaces. 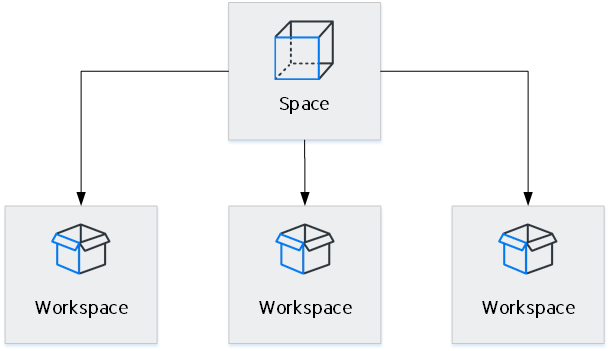 On-premises: For on-premises, the site admin creates spaces that will be containers for all the workspaces in your environment. Spaces can be isolated or shared. For details, see Create spaces for a site. Put workspaces that will share data in the same shared space. Put workspaces that will not share data in an isolated space. For details, see Manage spaces and Best practices for setting up spaces and workspaces. Configure other items. Set up your releases, teams, users, and so on. These items are the building blocks that help define how users work in ALM Octane. Define items that workspaces will share, such as releases, in their associated shared space. Define non-shared items in the relevant workspaces. Define rules. After defining the items above, configure how the ALM Octane user interface works, and control the actions users can perform.